Recently, Mr. Quqing, Chairman of China Coal Group, received a special letter from Ms. Lise Kingo, CEO and Executive Director of the United Nations Global Compact Organization. 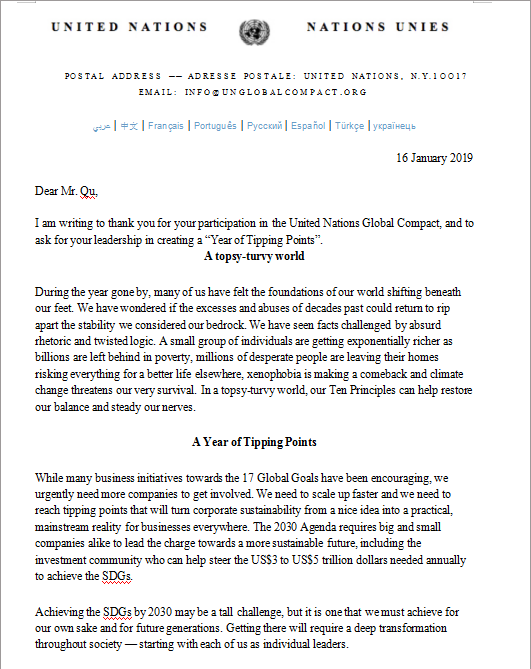 In the letter, he thanked China Coal Group for its outstanding contribution since joining the United Nations Global Compact Organization and asked China Coal Group to play a leading role in creating a "Years of Tipping Points". It is reported that the United Nations Global Compact is the largest and most influential sustainable development organization in the world, known as UNGC, which was proposed by UN Secretary-General Kofi Annan in 1995 and officially launched at UN Headquarters in July 2000. The organization calls on enterprises to abide by the ten basic principles of human rights, labour standards, environment and anti-corruption. It aims to mobilize transnational corporations around the world to join forces with United Nations agencies to participate in actions to reduce the negative impact of globalization and to promote the positive and sustainable development of globalization. According to statistics, more than 9,000 enterprises and organizations from 135 countries have joined the organization, of which the vast majority of the world's top 500 enterprises rank among them. Some enterprises with broad prospects for development and actively fulfilling their social responsibilities have joined in succession.,CNPC, Sinopec Group, HUAWEI, Yili and Lenovo and so on are all their member enterprises. As a cross-industry and diversified global enterprise, China Coal Group has successively established China Coal Manufacturing Group Co., Ltd. in the Cayman Islands of Britain, China Coal Group Co., Ltd. in the United States, Beijing Yike (Hong Kong) Network Technology Co., Ltd. in Hong Kong, China Mine Construction Equipment (Hong Kong) International Trade Co., Ltd., Shandong China Coal Industry and Mine Co., Ltd. Material Group (Hong Kong) International Trade Co., Ltd.The Group insists on incorporating social responsibility into the planning, development, production and operation of enterprises and all kinds of practical work. It has made positive contributions to the safety of production, environmental protection, safeguarding the rights and interests of workers, and participating in social public welfare undertakings. At the same time, China Coal Group has vigorously expanded the global overseas market, developed cross-border e-commerce international trade, and sold more than 10,000 products to 151 countries and regions worldwide through the group's self-developed Billion Mining Cloud Platform (which has joined the United Nations Global Compact Organization), with 480,000 global customers, which has made a positive contribution to promoting the healthy and sustainable development of global cross-border e-commerce. Quqing, chairman of China Coal Group, said that it was a great honor to receive a letter of thanks from the United Nations Global Compact Organization. This is a full recognition of the contribution made by China Coal Group in the global field. We will take this opportunity to play a leading role, actively fulfill corporate social responsibility, improve corporate social responsibility management level, and make more contributions to global sustainable development.